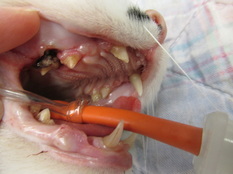 ​It is unfortunate that pet dental care doesn’t get the attention it deserves. 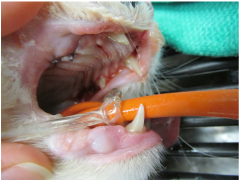 While people are accustomed to recognizing the importance of proper dental care for themselves, few recognize how critical this can also be for a pet. In fact, for pets, dental disease can be a serious and sometimes even life-threatening health problem. 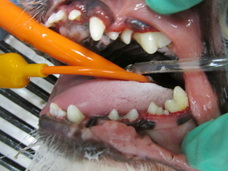 By some estimates, as many as 95% of all dogs and cats suffer from some degree of dental disease, which can range from a serious build-up of plaque on the teeth to full-blown periodontal disease, with loss of the bone structures that support the teeth as well as accompanying infection. Furthermore, dental disease can allow infections to spill over into the blood stream, which can then affect organs far away from the mouth area, including the heart, lungs, liver, and kidneys. At St. Matthews Animal Clinic, we know that home care needs to work hand in hand with the dental care we provide. Regular exams are, of course, a vital part of the picture. This can help reveal hidden infections and other symptoms of developing dental disease. Our Pet Dentistry Services include dental cleaning (under anesthesia), scaling and polishing of teeth, oral exam, and, if necessary, removal of decayed or damaged teeth. We have invested in a state-of-the-art digital dental radiography unit, which provides fast, accurate dental imaging for diagnosing dental problems. Of course, we also strongly encourage home dental care. We can help you assess what kind of routine will most benefit your pet and provide advice on ways to help maintain clean teeth and promote healthy gums through proper diet, the use of certain kinds of chew treats, and other means. 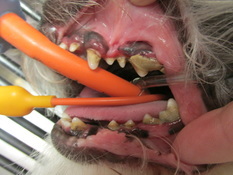 We know that dental treatments can be difficult for a pet and costly and time consuming for you. We also know that with proper care, many dental problems can be avoided. We are here to help, so be sure to bring any concerns to you veterinarian.